When we were renovating the house we had a discussion about whether we were going to have a doorbell. I thought a doorbell could be something useful to have. But my husband’s opinion was that this being a village, there’s no point in having a doorbell. It’s true that many houses in the village don’t have a doorbell. People usually knock, or don’t even bother knocking, they just walk in. We have one neighbour in particular who barges in without a preliminary knock or even a loud ‘dobar dan’. She’s one of the older residents of the village. Maybe that’s how things used to be done. If I’m going to see a neighbour, I usually knock, and if I don’t hear any sounds coming from inside, I’ll open the door and yell ‘dobar dan!’ If people do hear your knock or greeting, they’ll usually tell you to come in by yelling ‘napred!’ That’s your cue to open the door and walk in, you don’t have to wait for them to receive you. Or you’ll hear an upstairs window open and see a head poking outside to see who’s at the door. On a totally related note, arriving at someone’s door unannounced is perfectly acceptable and normal here. You can visit anyone at anytime you like. If they’re about to go out, they’ll tell you, otherwise you’re a welcome guest and they’ll stop whatever they’re doing and offer you something to drink and probably to eat too. I like this spontaneity and sense of hospitality. While living in Belgium I found it very odd that dropping by unannounced is not acceptable behaviour. My husband would always call his grandmother to tell her we were coming for a visit, even though we would always come by on the same day around the same time. So when we had friends come by one night out of the blue around dinner time, I was delighted. Especially because we had planned to fire up the brick oven for the first time this season and have homemade pizza with a couple of neighbours – who had to cancel last minute because their toddler was sick. So our unexpected guests were doubly welcome, especially since we had a lot of pizza dough… They did apologize profusely for just stopping by without calling us, but that’s because they live in London. Locals would not apologize, at least not that profusely. So we did end up having pizza with friends that night, just as planned! This spontaneity is one thing that I like about life in the village. Life goes at a different pace here. People have time. They make time. 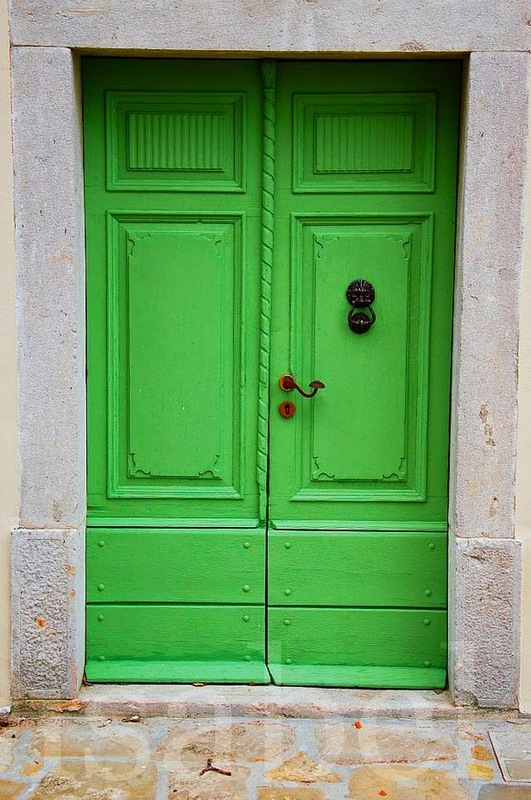 So if you’re in the village, feel free to knock on our green door (its not the one in the picture by the way). You don’t have to call first, and don’t look for a doorbell. Wow!I was suprised to read this article.i somehow thought anywhere in Europe and US of course its rude to land up in someone's place.Here in India,its still like that in the older neighbourhoods like Basavangudi and malleswaram where kids are running in and out of all the homes on that street.but newer localities have become a bit snooty. Interesting Shubha, I bet whoever had a TV at that time automatically had to invite the whole street to watch! One thing I found annoying in Bangalore was visiting anyone who lived in a compound or one of those fancy buildings with those security guards who take down your name, where you're coming from, who you're visiting, mobile number, etc... No chance of showing up unannounced!